But how is such a mission even possible? 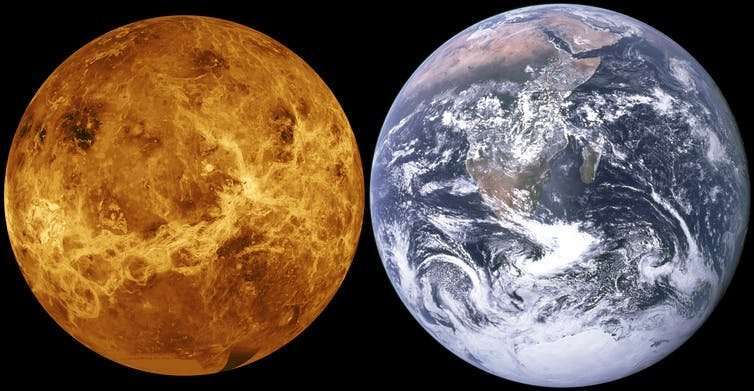 Temperatures on the planet's surface (about 460°C) are in fact hotter than Mercury, even though Venus is roughly double the distance from the sun. This is higher than the melting point of many metals including bismuth and lead, which may even fall as "snow" onto the higher mountain peaks. The surface is a barren rocky landscape consisting of vast plains of basaltic rock dotted with volcanic features, and several continent-scale mountainous regions. 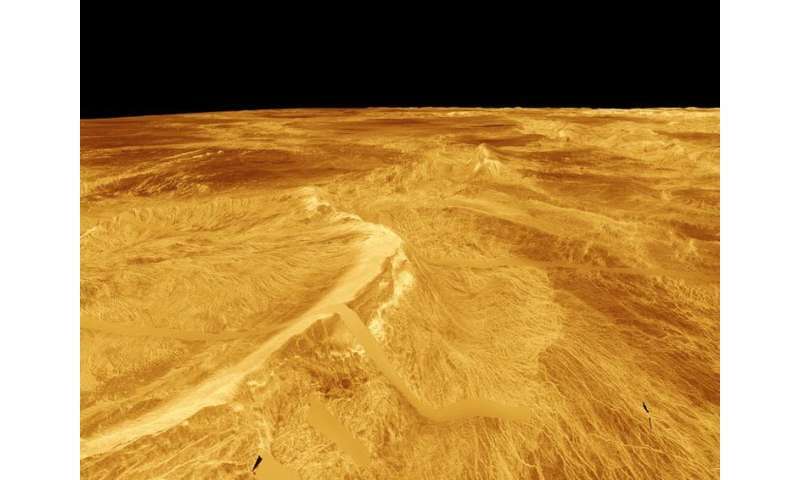 As surprising as it may seem, the upper atmosphere of Venus is the most Earth-like location in the solar system. Between altitudes of 50km and 60km, the pressure and temperature can be compared to regions of the Earth's lower atmosphere. The atmospheric pressure in the Venusian atmosphere at 55km is about half that of the pressure at sea level on Earth. In fact you would be fine without a pressure suit, as this is roughly equivalent to the air pressure you would encounter at the summit of Mount Kilimanjaro. Nor would you need to insulate yourself as the temperature here ranges between 20°C and 30°C. conceivably you could go for a walk on a platform outside the airship, carrying only your air supply and wearing a chemical hazard suit. Maybe so, but there would be serious forward and backward biological contamination issues to consider before taking that walk. Before we risk that, we need to understand if microbes are already living there, how they survive and their relationship (if any) to life on Earth. Lest we forget Velikovsky predicted a hot Venus, in the 700 degree range. The top "scientists" of the time predicted a hot day in Phoenix. Immanuel Velikovsky was a fraud that argued "a few thousand years ago, Venus collided repeatedly with the Earth and Mars, altering the course of history and causing many notable events that are chronicled in the Bible and in legends of ancient peoples." So that would explain how GR is correct sometimes too then, but is the clock broken or the observer? GR has always been shown to be correct by every experiment designed to test it. Velikovsky was a world class moron. And he got the mechanism wrong. Wildt got it right, prior to Velikovsky. Wildt was off by over 600 degrees, Velikovsky only missed it by 100 degrees or so. No, it explains that you and Velikovcky have much in common. It doesn't matter. Velikovsky's guess was nothing to do with science, and he got the mechanism wrong. Wildt got it right. I doubt we knew the full extent of the atmospheric pressure of Venus at the time Wildt did his work. Had we known, then he would have been a lot closer, I daresay. And Wildt's correct mechanism doesn't violate the laws of physics. The moron Velikovsky's does, and can therefore be discounted. Wildt guess was based on the pseudoscientific greenhouse nonsense, and the max temps possible missed it by hundreds of degrees with zero possibilities to reconcile discrepancies. And Velikovsky's mechanism doesn't violate any laws of physics contrary to your hand wavy exclamations. Wrong, idiot. We didn't know the extent of Venus' CO2 budget at that time. And Velikovsky's mechanism most certainly violates the laws of physics. No way whatsoever could it have been shot out of Jupiter. No way could it have performed the orbits that the cretin ascribed to it. No way could it then settle into the most circularised orbit in the solar system in that time. Among many other impossibilities. He was a moron. End of story. The atmospheric pressure in the Venusian atmosphere at 55km is about half that of the pressure at sea level on Earth. In fact you would be fine without a pressure suit, as this is roughly equivalent to the air pressure you would encounter at the summit of Mount Kilimanjaro. Lol. Pseudoscience despite us having measured the atmospheric content, and the pressure. And we know how much radiation it receives. Etc, etc. And we know it is an 'old' planet, given its topography, which it couldn't support if it were recently molten. Anybody that believes Velikovsky's nonsense is, by definition, scientifically illiterate. Interesting article on Venus, but exactly zero reasons presented to send people there. Unmanned probes and balloons for sure, explore away. But what, specifically, would require an astronaut? Walk around an expensive balloon, gazing down at clouds, getting sunburn? The fact that there's a region of atmosphere near STP is neat, but not compelling. There is nothing there. You'd be more useless than hanging around in LEO. This is as bad and wasteful an idea as the Lunar Gateway (LOP-G). Get on with colonizing moon and Mars, and mining asteroids. Places with resources. Only thing to be done with Venus is planet bomb it with icy Kuiper belt objects, to terraform it. Love to do the same to Mars. Plenty of water and nitrogen out there. But I'm currently living in a country that thinks going back to burning coal is a good idea... So not holding my breath for the launch of the colonization armadas any time soon. They sure ain't goin' to the surface. But a lot more data can be gathered from the upper atmosphere than we have now. It's likely to be disappointing, though. I wouldn't spend the money now. Better to wait a century or so. There's a physical oversight here that needs to be addressed. The transition between Venusian LEO (LVO?) and floating bulky airships (and the tanks of gas to inflate them [or the bulky machinery to extract N2] ) is going to involve at some point a high-temperature, maximum aerodynamic buffeting and drag, regime. Certainly drogues and parachutes will account for some of the transition, but time is of the essence: those ships do have to get inflated during a parachute transition which will be measured in a few minutes at best. The best retro-firing system couldn't support that tonnage. Perhaps you would need a high-efficiency, long-wing airframe to buy time, but at some point of several minutes-long, the bulky, flopping, ungainly drag-parasitic airship is going to render aerodynamic lift futile. I can only suggest using hyper-robust materials and just letting the chutes and craft overshoot to ~3 atmospheres, and then lift to operating elevation later hours later.